Above all, you will not fear the wiki! Did everybody get the handouts? 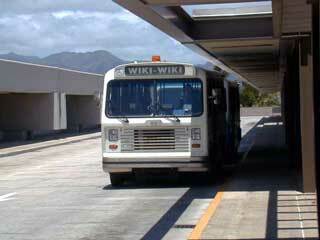 Ward Cunningham, the inventor of the first wiki, thought of calling it a ‘Quick Web’ but that sounded boring, and he remembered the ‘Wiki Wiki’ shuttle buses at Honolulu airport and called it WikiWikiWeb instead. The text markup rules for a particular wiki – e.g., *this* means <b>this</b>. Links to non-existent pages look different, so it’s obvious what pages don’t exist. Also known as CamelCase. People who build wikis that use this convention quickly get used to it, but it can look funny to people who aren’t used to it. It takes a little more effort, but the results look more like normal text. Pages can have links to pages that haven’t even been written yet. A few simple text conventions provide access to the most useful page markup. The mechanisms of editing and organizing are the same as those of writing, so any writer is automatically an editor and organizer. The title of a page will indicate its content, and will be constructed to avoid most name clashes, typically by forming noun phrases. Activity within the site can be watched and reviewed by any visitor to the site. Click on the link to your hobby page and write something there. Try experimenting with the formatting. Sometimes pages in a wiki are called topics or articles or, to be reallyabstract and computer sciency, nodes. Sometimes a collection of wiki pages is called a web. Confusing, but true! Refers to the ability to make links from one wiki to another. A wiki is a living, growing organism. You can always make it perfect later. For now, just make it good enough. What are wikis good for? What makes a wiki succeed? BarnRaising occurs when a community actively decides to come to the same place at the same time to help achieve some specific goal. … BarnRaising is part of the difference between SlashDot and wiki. With SlashDot the barn is already raised – the OpeningStatement already written – before you start, and everyone just sits around bitchin' about it. What makes a wiki fail? It happens, and it’s no big deal. This is when you stop thinking of wiki pages and start thinking in terms of nodes. It’s a wiki itself, of course! Would you like to install your own wiki software or put your wiki on a server hosted by someone else? Do you want pages stored in files or a database? Cunningham, W. (2001). The Wiki way: quick collaboration on the Web. Boston: Addison-Wesley.